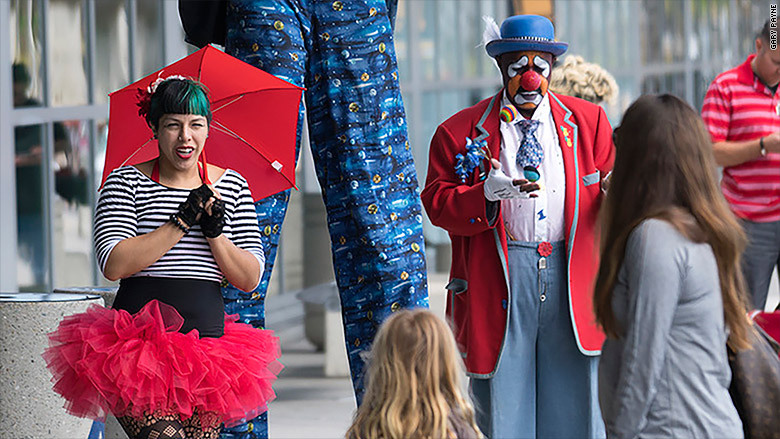 The San Diego International Airport has hired the Fern Street Circus to perform for fliers. 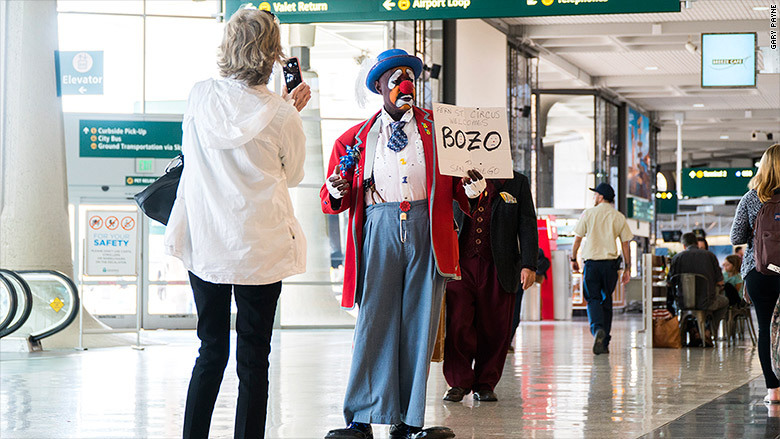 Starting Wednesday, a team of eight circus performers, including stilt walkers, jugglers, clowns and musicians will be roaming the airport. There's no set schedule for when and where the performers will be at the airport, but they are committed to at least one performance a month. Some days the performers might be singing a welcome song for de-boarding passengers, while at other times travelers stuck in a security line might be getting entertained with a juggling act. There are also plans to have some acts at baggage claim. "Maybe you will see an obvious clown looking for his bag and it turns out to be a giant inflatable duck and then someone says, 'no that's mine,' and then another inflatable duck comes around," said, John Highkin, who is the circus's co-director and stilt walker. The circus's residency will end with a roughly 30-minute performance in October that combines all the acts that have been rehearsed throughout the airport over the previous 10 months. The collaboration is part of the airport's performing arts program, and the selection process involved an application and interviews. The circus has been scoping out the airport since January looking for potential performance spots and getting ideas for acts. The entertainment might be welcomed relief for fliers this travel season. Airports across the country have been experiencing an influx of travelers thanks to the improving economy and low ticket prices, but the surge has led to lengthy security lines. And they're only expected to get worse this summer. The San Diego airport had its biggest traffic year in 2015, and is expecting a 5.8% increase in fliers in July and August from its normal traffic, which means roughly 227,000 more people moving through the airport. The circus could help ease tensions, but not everyone loves clowns or wants to be entertained as they hustle through the airport. Highkin's said his team is aware of that. "We will make the contact really short. And if we are in place where people are moving and in transit, we will make sure that people can keep just walking by and those who want to look and linger can."